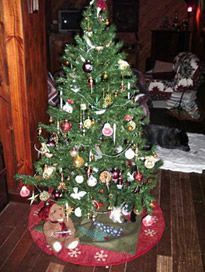 Some have a predilection for greenery swags and pine cones; others love rustic wooden ornaments and handcrafted fabric creations. 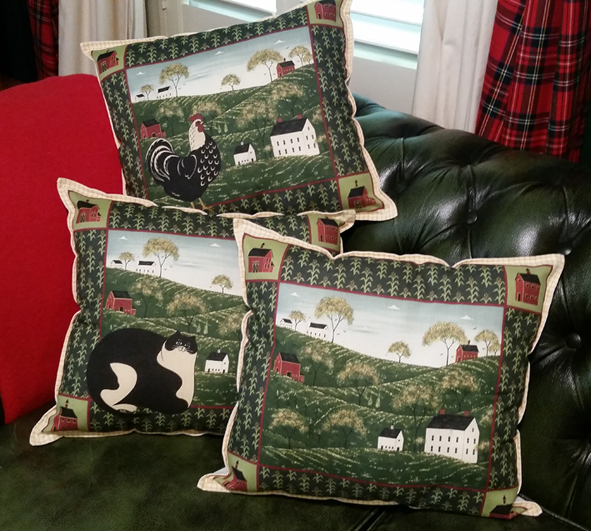 But for Queenslander Ann-Marie Lavers-Grimm, she loves all these things in moderation … her particular passion being for everything that’s shiny and bright! Beautiful vintage and contemporary-made glass baubles and sparkling glass pebbles in silver, gold and clear are all artfully arranged on tabletops and benches throughout the entire interior of the home to create a wide series of enchanting vignettes, mixed with the widest collection of treasures old and new that have been amassed over the years by this very committed Christmas bower bird! Ann-Marie and husband Trevor live in a superb, contemporary-built Queenslander on half an acre of land with views across to Fraser Island, on the Queensland Sunshine Coast. 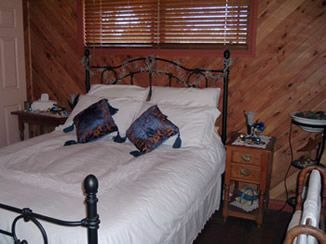 They purchased the property some fifteen years ago when it was two years old, and since that time have worked tirelessly to make the weatherboard residence – with its tongue-and groove interior walls, hardwood flooring and cathedral ceilings – their own by way of employing an individual interpretation of country style decorating and furnishing. 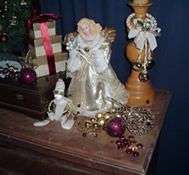 No time of the year is the couple’s individual interpretation of the country look better evidenced than around Christmas, especially when Ann-Marie hauls out her vast collection of delicate glass ornaments and decorations and starts to transform the look within each room. 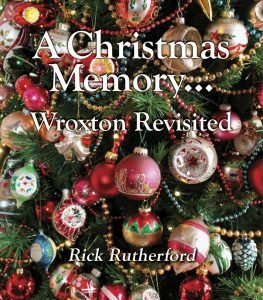 The process normally commences around the beginning of December and usually takes a few days, with treatments carried out in sympathy with the main colour scheme in each space. 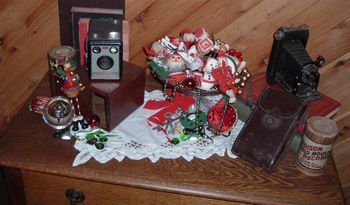 With a combination of old and newly-made glass baubles, an array of handcrafted ornaments, flotsam and jetsam that has been collected on the beach and given a gold painted finish, vintage Christmas treasures, things of metal and wood, traditional Santa figures and heavenly angels, ornaments fashioned in tribute to man’s best friend and his feline equivalent, plus a host of other such distinctive decorations, the interior of the Lavers-Grimm’s home takes on an enchanting look that annually delights all visitors – family and friends alike. 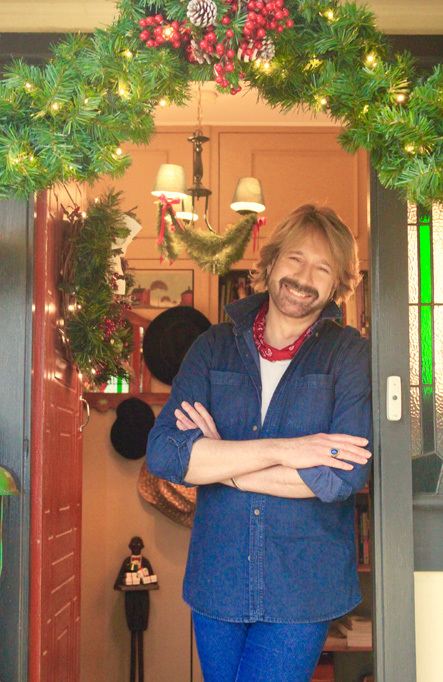 While Ann-Marie is professionally employed in a local pharmacy, after seeing how she artfully adorns her house for the Christmas season, one can be forgiven for thinking that she might be a professional display artist. 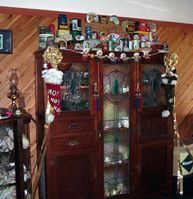 While not formally trained in such disciplines, she attributes a deal of her passion and ability to group and balance objects together in visually pleasing, innovative and well-balanced arrangements to her grandmother who was also naturally talented at such things and had a wonderful home that was brimming with all sorts of ornamentation and unique collectables. 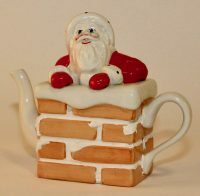 Come Christmastime, Ann-Marie’s love of the festive season, and her great skill at creating unique decorative arrangements throughout all the rooms of her Queensland home, really come to the fore. 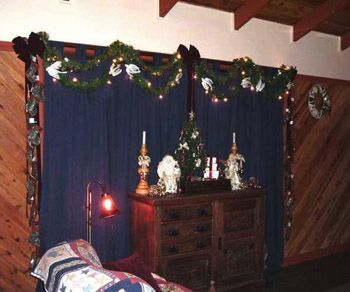 From its wide front verandah to its master bedroom, from its guest quarters and office to its open-plan spacious living area which incorporates entrance and kitchen, dining and lounge, the home of the Lavers-Grimm provides a wonderfully rustic country ‘stage’ on which Ann-Marie annually works her Christmas decorating magic. 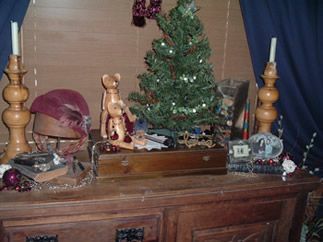 Each year there’s different themes chosen for different displays. 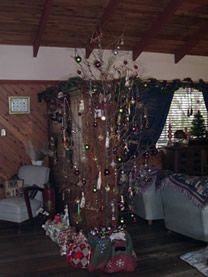 A huge dried twig tree in the lounge room – the ideal means of showcasing a wide collection of burgundy and gold glass ornaments and decorations – was the star attraction one year, and then the next a cane conical tree took its place, surrounded by amber glass collectables. 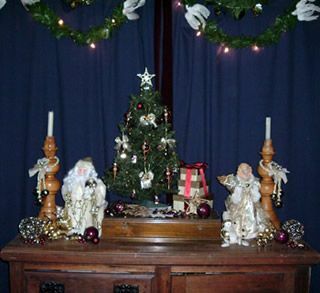 White feathered doves – once used for a pink and white tree – now adorn a garland of greenery across the windows in the living area, with fairy lights intertwined. 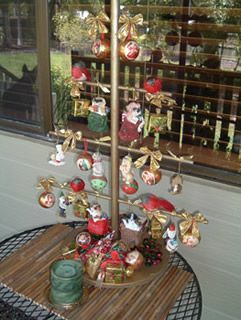 Ornaments which pay tribute to cats and dogs decorate the branches of a dowel tree which sits on the verandah and was made for Ann-Marie by her father-in-law some 20 years ago. 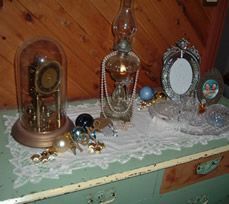 Vintage ornaments of glass and figural decorations of various mediums are grouped together in bowls and displayed on benches and table tops. 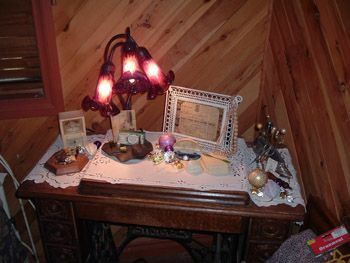 They are dotted amongst the china and glassware on dressing tables and buffets; they’re placed where the soft illumination of table-top lamps will show them off to best advantage; and they’re even incorporated into pre-existing displays on bookcases and dresser shelves filled with china. 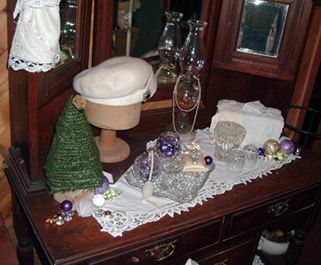 “I usually collect interesting pieces – glass ornaments and other such decorations – throughout the year … from department and country stores as well as garage sales, op shops and the like, and group them in the various rooms of the house so that they reflect the main colour theme in each space … from purples and olive greens in the guest quarters to navy and white in the master bedroom and traditional red and green in the office. 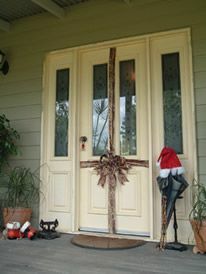 Even the front door has its own special treatment, with a wide ribbon used to give the impression that the front door has been gift wrapped” explains Ann-Marie. 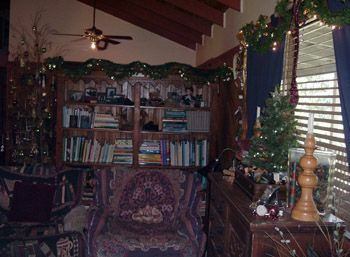 The ultimate result, as the pictures here attest, is completely enchanting as Ann-Marie’s Christmas decorating style adds a unique, personal quality to what is a distinct, wonderfully rustic country home overlooking the Pacific within an idyllic Queensland coastal setting.